Dubai International Capital (DIC), the investment group aiming to buy into Liverpool, says it would be willing to share power with co-owner Tom Hicks. DIC lead negotiator Amanda Staveley says the firm is "prepared to accept a 49% shareholding in Liverpool FC". Hicks is keen to keep his interest while fellow American co-owner George Gillett is apparently open to offers. The new peace deal would see DIC allow Hicks to buy one per cent of Gillett's share giving him a 51% stake. Staveley is a senior partner at PCP Capital Partners, who are acting on behalf of the Dubai government's private equity arm in the matter. She said: "Subject to renegotiation of a partnership agreement and subject to the usual stringent minority shareholder protection rights we would be prepared to accept a 49% shareholding in Liverpool FC. "We have decided that this arrangement provides the best possible solution to the situation and would be in the best interests of the club and their loyal fans." 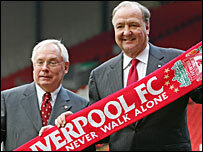 Gillett and Hicks took control of Liverpool in a deal worth £218.9m in February 2007. But their own relationship has broken down and the pair - Hicks in particular - have been the target for savage criticism from supporters. Gillett it is believed is willing to sell but the situation is further complicated by an agreement between him and Hicks that means one cannot sell his share without the agreement of the other. BBC Sports Editor Mihir Bose said: "In the past, Dubai has not been interested in being a minority shareholder but is now prepared to have a 49% stake. "Well-placed sources have told me Dubai have no problems with Hicks." He added: "I understand the deal being discussed between Gillett and DIC for his Liverpool shares would involve Dubai paying him £60m in cash, which would represent a profit of £40m on his cash investment. "As part of the deal DIC would also share future profits in Liverpool and take over the loans for which Gillett has provided guarantees. "Sources close to the deal have told me that he still has a conceptual problem about selling Liverpool, a club he fought so hard to acquire last year, snatching it away from DIC at the last minute. "Gillett has also to agree with the offer Dubai has made to him and it is not absolutely certain he will sell."